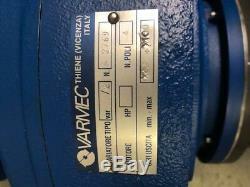 MECHANICAL VARIABLE SPEED DRIVE GEARBOX, VARIATOR AND MOTOR. 2 HP 3 PHASE MOTOR (1400 rpm) DRIVING MECHANICAL VARIATOR CONNECTED TO TWO STAGE HELICAL GEAR HEAD, WITH 32MM DIA OUTPUT SHAFT. OUTPUT SPEED RANGE: 20 TO 100 RPM. OUTPUT TORQUE: 25 TO 12Nm. CONTROL: MANUAL HANDWHEEL WITH SCALE. 2 pole motor (2800 rpm) would give output speed range: 40-200 rpm. 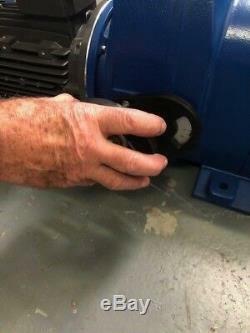 6 pole motor (970 rpm) would give c. Control options: Handwheel can be fitted on other side. LISTING NOT THE ALTERNATIVE MOTOR SPECIFICATIONS LISTED DIRECTLY ABOVE. FOR THE ALTERNATIVE MOTOR PRICES. PARTS OF SCOTLAND AND IRELAND WILL COST MORE. 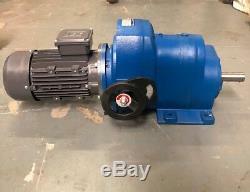 The item "MECHANICAL VARIABLE SPEED DRIVE VARIATOR GEARBOX AND MOTOR" is in sale since Friday, February 8, 2019. 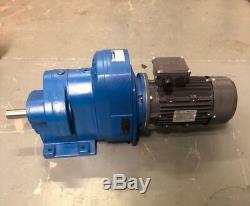 This item is in the category "Business, Office & Industrial\Automation, Motors & Drives\Mechanical Power Transmission\Gearboxes & Speed Reducers". 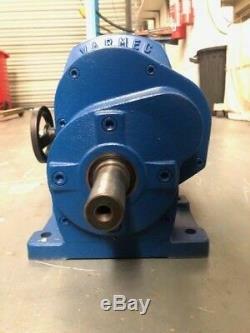 The seller is "combidriveltd" and is located in Crosshands,.